Proctor & Gamble (P&G) challenged CCG to develop a process and packaging to consolidate Consumer sample requests. These individual packages would contain multiple brand samples along with personalized, variable product literature, and relevant trackable household coupons. 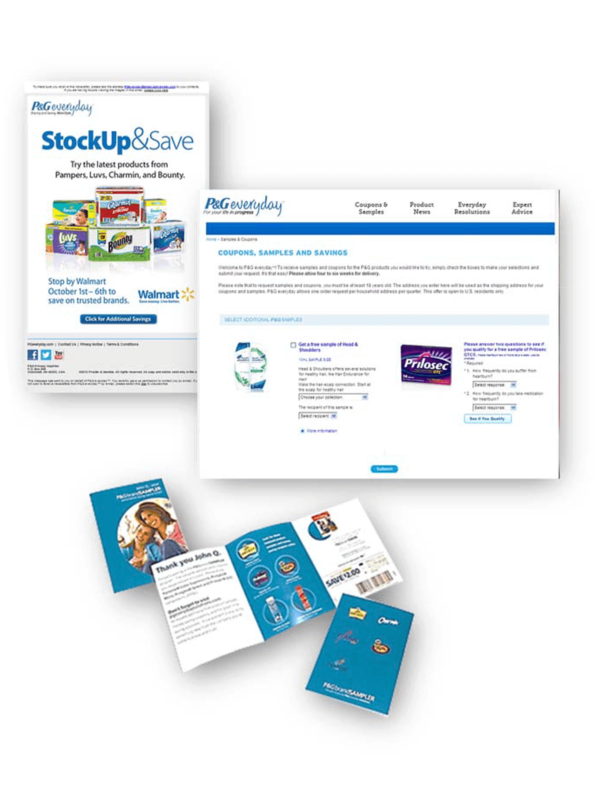 CCG developed a system that completely re-engineered P&G’s traditional product sampling and coupon fulfillment program. The new program provided a way for P&G to reduce or eliminate the duplication of effort across vertically siloed brands. This dramatically reduced cost, increased speed to market, strengthened the P&G Brand by consolidating products into one uniquely recognizable package, and increased Customer Satisfaction. The overall fulfillment processing was streamlined, data management and marketing effectiveness was more easily measured, and mailing costs were significantly reduced. The new process also reduced the cost-of-entry for P&G’s new or less popular brands allowing them to “piggy-back” their sampling and couponing along with much larger brands. Development of a personalized, variability printed coupon book with stratified and segmented discounts further reduced costs since coupon values were now “rulesdriven” based on Consumer loyalty or competitive positioning. This allowed for a more granular understanding of the marketing effectiveness and ROI. The program has now expanded into social media and mobile applications. It has been a huge success and has provided P&G with many powerful and unique capabilities.